Junior Elijah Everett-Hutchins gathers one of his nine rebounds during Immaculate’s 64-51 ECT semifinal win on Tuesday, February 19. 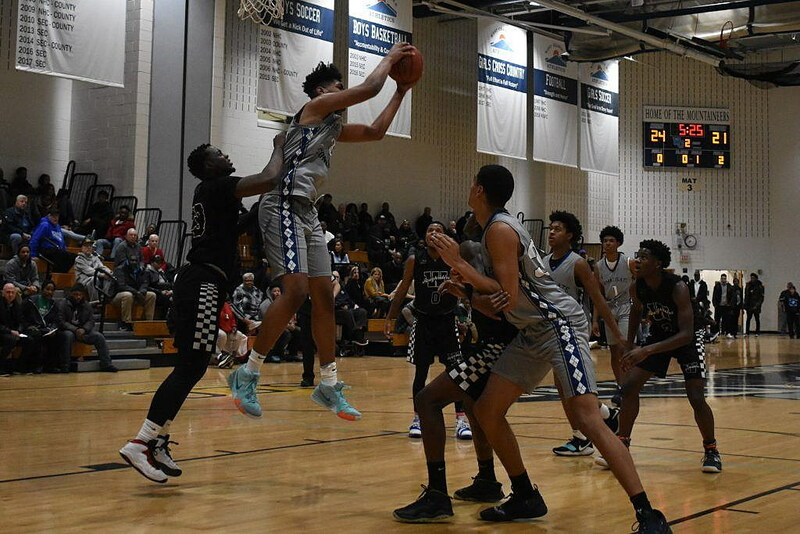 WEST ORANGE—The boys basketball teams for Immaculate Conception and West Side high schools met for the third time this year Tuesday night. 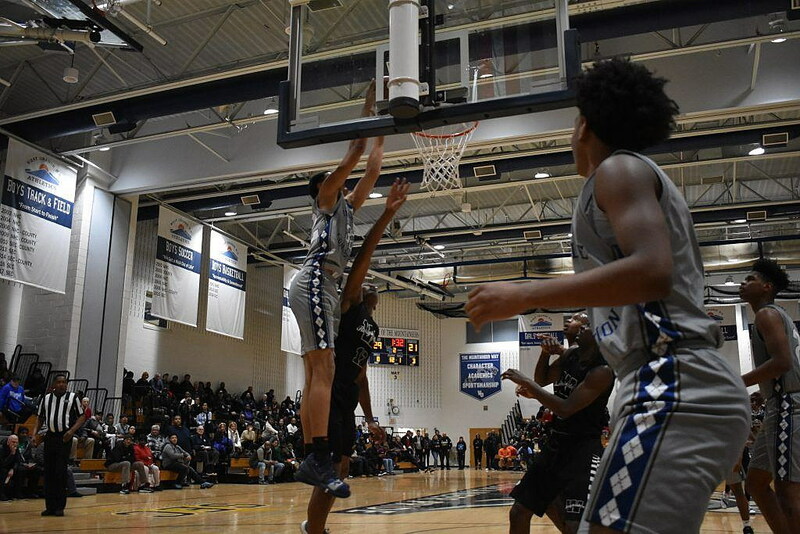 Each team had won a previous meeting during the regular season, but as this time it was during the Essex County Tournament semifinals, there was a lot more on the line. It was a weight the 2-seeded Lions bore better than the overmatched 3-seeded Riders, as Immaculate ran ahead early and never looked back on their way to a 64-51 win and their second ECT finals appearance in a row. Familiarity with the Roughriders didn’t hurt, head coach Jimmy Salmon said after the win, but wasn’t something the Lions depended on. ICHS has now won three games in a row, as well as seven of their last eight, something Salmon said was the hoped for outcome when he put this year’s schedule together. While Saturday’s final against Newark East Side—for the second straight year—will likely be every bit the dogfight, the semifinal game against West Side wasn’t. Immaculate ran out to a 8-3 lead over the course of the first three and a half minutes of the first quarter, buoyed by baskets by Amar’e Marshall, Jayden Brown and Elijah Hutchins-Everett. West Side would claw their way back in over the course of the remaining four minutes with the help of a pair of 3-point shots, but the Lions were too much on the boards and too disruptive on defense. Hutchins-Everett scored 10 of his 16 points in that first frame, and over the course of the first half, fielded nearly all of his nine rebounds. The 6-4 Hutchins-Everett’s performance is always impressive, but Tuesday night was even more so as he was nursing an injury to his ankle he had incurred on Monday in a 65-61 win over Payne Tech. While Hutchins-Everett showed grit in playing through pain, he certainly appeared to tire a little as the game progressed. So other ICHS players needed to step up, and it should come as no surprise that sophomore Marshall, and senior Nick Jourdain answered the call. ICHS’ Nick Jourdain dunks over a West Side defender. The senior scored 12 points during the 64-51 win. Marshall, who helped kick things off during the Lions’ original run, finished the night with 14 point, including a key 3-point basket during a 7-3 run to start the fourth quarter and a dagger basket to finish things off near the end of the game. Jourdain continues to have an excellent final season for Immaculate, and shook the gym with three more of the dunks he’s been delighting Lions fans with all year. With Hutchins-Everett banged up, somebody needed to get rebounds and Marshall, Jourdain and junior Zion Bethea also contributed on the glass, totaling 17 rebounds and nearly eliminating West Side’s second chances, especially in the third and fourth quarter. Bethea added 12 points to the total, the fourth Lion with double-digit points for the game. Now Immaculate heads to Essex County College, where they face an East Side team they finally beat this season. Last year’s battle was a classic, with a down-to-the-wire ending that saw former Lion and current Syracuse guard Jalen Carey tie the game four times before the Red Raiders finally broke away. Salmon knows Immaculate is in for another battle this weekend when the game tips off at 3:30.